After he moved from the Studio Building in Toronto to Manotick, near Ottawa, A.Y. Jackson's "artist trails" changed. He began to visit the Ottawa Valley, with the Ottawa and Madawaska Rivers. In the process of transforming the on-the-spot sketch, lot 126 in this sale, to the larger studio canvas, Jackson made some interesting choices. Although the elements of both works are similar, in the canvas Jackson added more blue to the water, creating more contrast to the warm autumn colours in the trees, and gave more spatial clarity to the river. The church with its tall spires, a striking architectural feature, is more strongly emphasized, and we see a broader view of the sky and a distant view of a blue mountain. The original fluid study, concentrating on mass, tone and colour, acquired a greater definition in the canvas. 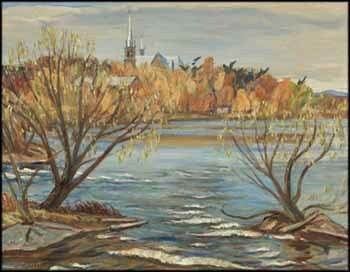 Jackson's well-honed eye for composition and his feeling for the essence of a place can be clearly seen in The Madawaska at Arnprior. The inclusion of this canvas and its related sketch in this auction offers a rare opportunity to acquire both these works.